just wondering where it went on the web.. it was just before SRV died and he invited Brian to come up and play through his rig. Heard the story. Are you looking for Brian’s account of the event or something more. I didn’t think there was video. Mud Island, Memphis. Probably just a photo. Q: I read that one time in Memphis, you played with Stevie Ray Vaughan. Is that true and what did you think about him? A: Yes, that's true, I did play with him. First of all, Stevie Ray was magic. It's funny because people always want to know about his guitars and his amps but what I want to tell you is that it was in his fingers. It had nothing to do with his guitar and amp. I think he could have been playing a Silvertone guitar through a transistor radio. That night at "Mud Island" in Memphis I was watching him from the side and he called me up on stage and he handed me his guitar and he said, "Play!". I didn't know what to expect. I thought it would be really loud and just, you know, all over the stage. It wasn't though, it was about as loud as I set my guitars. It even kind of sounded like mine. I was so surprised. He stood there in front of the pedal board with his arms crossed just hitting different pedals. At that moment I realized...jeez, it's all about what's in this guy's fingers. What can I say? He was one of the truly great guitar players. We never played together, at the same time but I'll never forget that night. 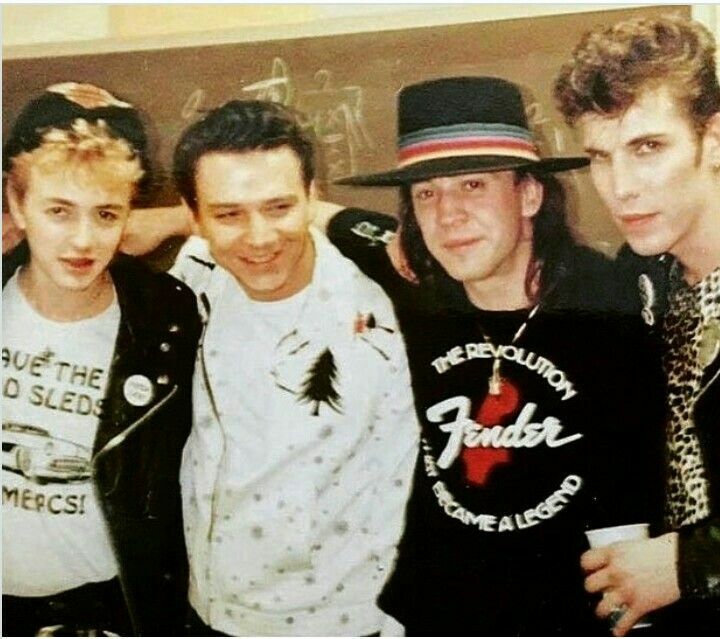 "That photo was taken on a night when we (Stray Cats) were opening for Stevie Ray on a summer tour. I was watching the show from the side of the stage...he was brilliant as usual! I was standing there, when he suddenly called me up to play. Funny thing was that I didn't have my glasses or contact lenses in so, I really couldn't see that well. (laughing) He actually had to grab my hand and pull me up on stage with him. I remember thinking, this is great, I'm finally going to be able to hear what this amazing guitar sounds like! He had amps all over the place! He hands me his Strat and just kind of stood there watching me. I think we did The House Is Rockin. The weirdest thing was that it sounded just like my guitar! It was so strange. When I played his Strat through all those amps, it sounded just like me, playing my Gretsch through a Fender Bassman, same volume, everything. So it just kind of proved a point to me, if I play Stevie Ray's Strat through his wall of amps and he makes it sound so different....it's in your hands, the sound comes from you! That's what really got me, it was his gear and it sounded nothing like him. Stevie Ray was a great guy. He would get barbecue or his favorite foods flown if and he'd invite me back to have a meal with him. He was battling some demons at the time, like we all do, but he was a brilliant guitar player and I love listening to him." Strats ARE the funniest of all gretsch guitars mind you. During the Ignition tour, Brian went to a local live blues club ("Muddy Waters") after the gig in Oslo. He was persuaded to join the band for a few numbers, and when he was handed a Strat, he said something like "....jeeez, this is not my brand...."
^ that out of tune strat has a tele neck!! AND...what about the footage of Brian playing in a basement (his home maybe? Or record shop?) He played on his own, just guitar and vocals. I liked it cos I realized guys like him are good as they made themselves do this. Practice the whole song, including solo, so they'd be good with the band. A good example. Can't find it anywhere. Any clues? You mean this, Vince? Brian solo in a Japanese guitar shop +/- 1992...? YES! Both those. Love em. Just working your through a song, keeping time by stamping your foot . No playing bits of it here and there whilst watching TV. Take some time to nail your parts and singing so you can't go wrong. Sort of! Id love to see the Home/basement video again where he shows all his vintage guitars. Its not on YouTube anymore.